Victoria Hospital and Summerside service is proposed to be removed from Route 16. Frequency would increase during all time periods except weekend mornings and evenings. 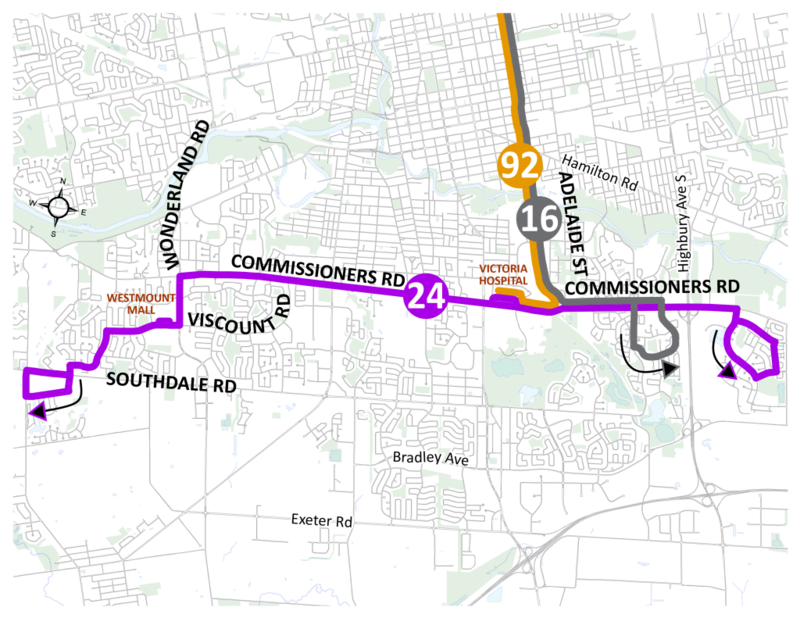 Route 24 is proposed to be modified to form a direct east-west Commissioners route between Wonderland and Summerside. The Talbot Village loop would also be shortened, removing service on Settlement Trail and Colonel Talbot between Raleigh and Pack Rd. Frequency is set to increase in all time periods except weekday peak periods which would decrease. Sunday service would be introduced. For Route 92, base period service is proposed to be eliminated and frequency reduced during peak periods. Route 92’s productivity is just above the minimum threshold for express routes and it is not seeing ridership growth at the same rate as Route 90 or 91. A reduction in frequency and operating hours would improve productivity and allow for reinvestment of those hours into Routes 16 and 24. Route 16’s deviation to Victoria Hospital in both directions has added travel time for thru passengers and reduced the route’s productivity. There has been limited uptake in passengers accessing the hospital. The productivity in the A and B branches, through Pond Mills and Summerside respectively, also has poor ridership and productivity, especially in off-peak periods. Route 16 north of Commissioners, without the hospital deviation, operates with high ridership. There is an opportunity to improve service where it’s needed (north of Commissioners) while reducing service where it’s not justified (through the neighbourhoods). Currently the ridership on Route 24 and Route 16B in Summerside is very similar, as such, it is proposed that Route 24 be extended east on Commissioners to Summerside to replace the service currently provided by Route 16B. Along the current 16A branch through Pond Mils, some passengers would require a further walk to transit, and others would receive increased frequency. In Summerside, where the 16B currently services, the most significant change for passengers would be span of service. Summerside would no longer have service after 7pm on weekdays, before 8am and after 6pm on Saturdays, and before 10am and after 5pm on Sundays. The frequency on Sundays would be an improvement for Summerside from 60 minutes to 40 minutes. While the proposed change will impact some passengers, the recommendations better match service with demand. Finally, passengers on Base Line Road between Wellington and Cathcart would no longer have service; however, the majority of passengers remain well within the 400 metre walking distance to a transit stop.